Bedroom Appreciation. | Nicki Kinickie Nicki Kinickie: Bedroom Appreciation. COSY: I love our relaxing boudoir! I just love pushing zeds, making my way to the land of nod, being out for the count - whatever you like to call it, sleep is amazing! I know we are a long time dead an' all that malarky but what is better than waking up in a cosy bubble of slumber only to realise it is Saturday morning and you have nowhere to be and can stay in that cosy bubble for as long as you wish! It is so important to have a good night's sleep. Mainly so that your body can relax fully and recharge so you wake the next day feeling refreshed and ready for whatever comes your way! Also, a good eight hour sleep promotes weight loss as it gives your body time to burn off calories not to mention how good it is for maintaining a youthful complexion. Tis true! I wanted our bedroom to be the perfect slumber chamber. Comfy, cosy and relaxing. Our feature wall is pretty much the only splash of colour we have in there and even that is a chilled out green, nothing too OTT. The rest is cream and kept to a minimum so it doesn't feel too cluttered. The other rooms in the house have mismatching furniture and an array of colours which I love but for this room I didn't want anything too busy. I love our dimmer wall lights and fairy lights, they create the ultimate relaxing atmosphere. I love our bed. We have had it four years now and I think I love it more now than when we first got it. The memory foam mattress and pillows are perfect for a good nights sleep - not that either of us luckily have much trouble drifting off! It is also king size which is great if you like having your own space sometimes when going to sleep. 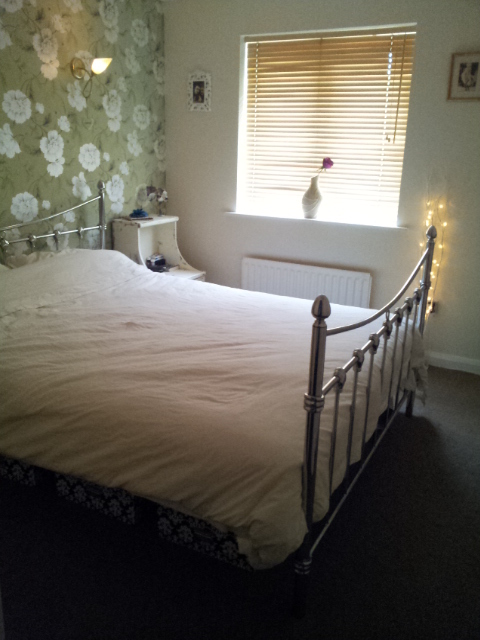 Yep, I have to say I do love our bedroom very much! I look forward to getting into bed each night (god I sound so old!) and look forward to a lay in in it on a weekend. I miss it when I sleep in another bed elsewhere and my head lays on a strange pillow pining for my memory foam one which is moulded perfectly to fit the shape of my head (in fact we have been known to take our pillows on our travels) and sometimes if I have had a busy or stressful day I like to take ten minutes when I get in to lay down and enjoy the comfiness and relaxtion of our lovely bed and recharge. 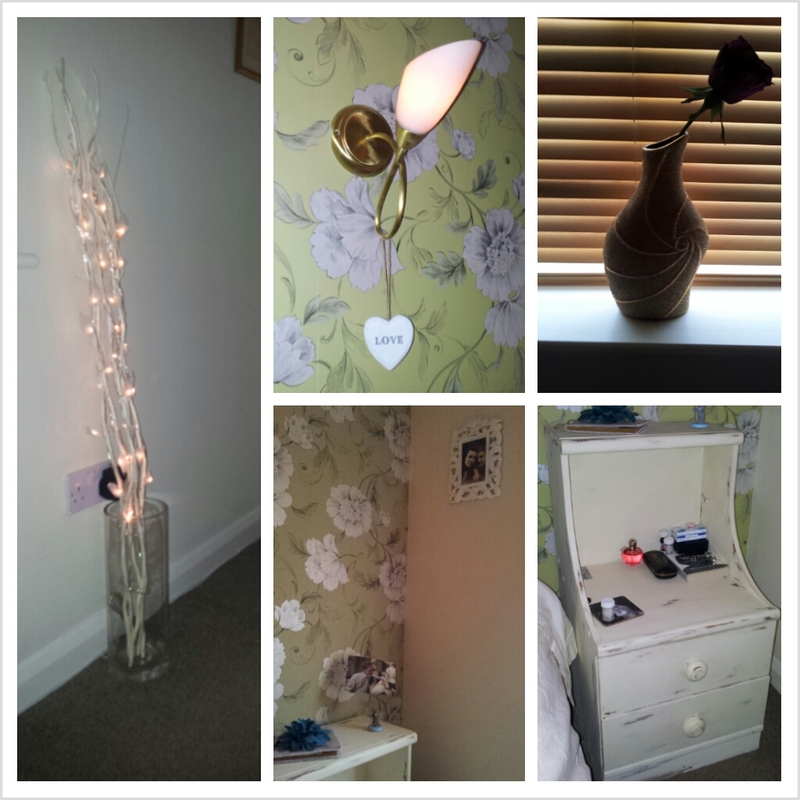 Apart from a couple of accessories, our bedroom is pretty much complete which is nice feeling! Can't wait until other rooms in the house are too. What about you? What's your bedroom like? Have you made it into the perfect sleeping environment?